I find my neighbors to be very interesting, when I'm not annoyed by the sounds of their screaming child drifting through the walls or the way the man stomps around on their hardwood floors so hard he rattles our bookshelves. Otherwise, they're very interesting. He is German. She is French Canadian. Their child is about 1 and a half or so. 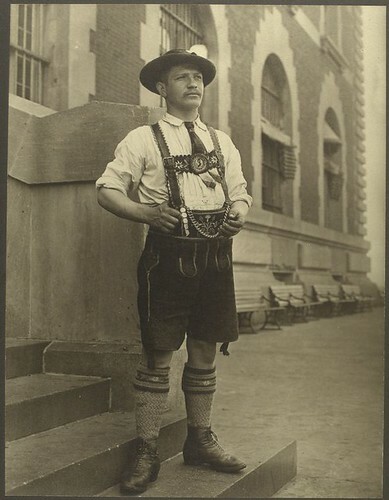 He's unbelievably cute in a towheaded, he-should-be-wearing-lederhosen-on-a-travel-poster-for-Bavaria sort of way. What I find most interesting, aside from the fact that they always seem to be arguing but arguing civilly (or at the very least he always seems to be defending himself to her in some way), is that they only speak English to each other. He only speaks German to the child, and she only speaks French to the child. I mean, it's great in that he'll grow up to be trilingual. Although I have to wonder if they shouldn't maybe occasionally speak English to him as well. I guess they assume he'll just pick it up from them talking to each other. All this reminds me of a man I heard talking at the playground one day when I was taking my honorary niece off her mother's hands for a morning. He was Caucasian, but his daughter who was just starting to talk was obviously part Asian. I heard him talking to his friend about how great it was that his wife only spoke Japanese to the child and that she'd grow up to be bilingual like her. The problem was that he didn't speak any Japanese. So his daughter would come up to him and make some sounds and he didn't know if it was baby talk or if she was actually saying something to him in Japanese. The C-man has a friend whose parents are German and Russian. It's the same situation. He only speaks German with M, and his wife only speaks Russian, but they speak English to each other. M speaks perfect English, but with this really funny accent, kind of a cross between a German accent and a Russian accent.